1) Download and Install Apache OpenOffice. 2) Download PowerWorship from the following URL and unzip the archive to any location on your hard drive. The location where you unzipped the archive should now contain a directory named PowerWorshipMP_0.1. This directory will be referred to as <pwmp_install_root> in the remaining steps. 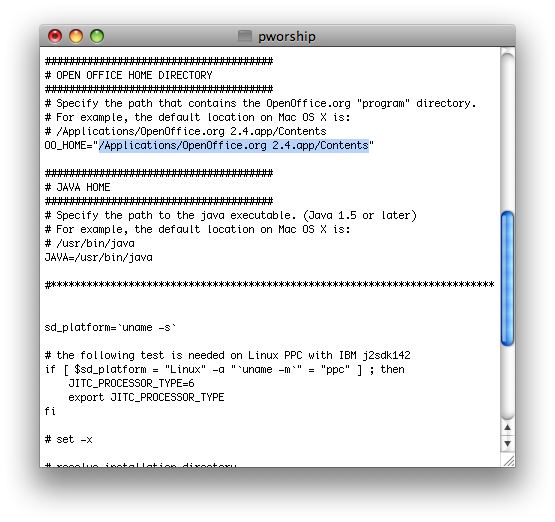 3) Launch TextEdit and then select File > Open and navigate to <pwmp_install_root>/pworship, and open the file. Scroll down (if needed) and make sure OO_HOME points to the correct location, depending where you installed Apache OpenOffice. Quit TextEdit, saving your changes to the pworship script -- if needed. 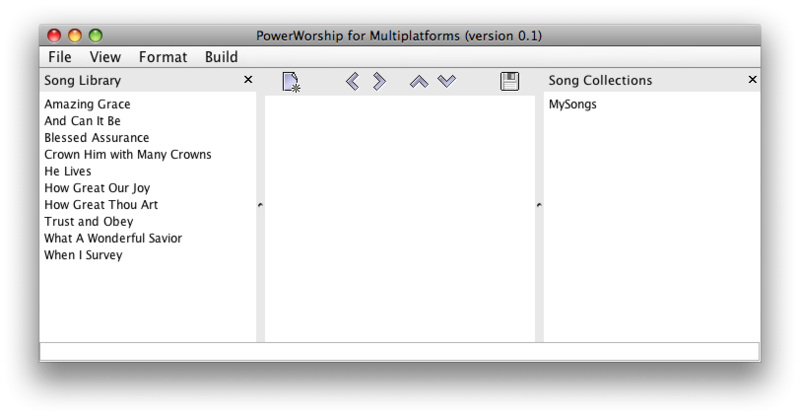 4) To launch PowerWorship, navigate to <pwmp_install_root> using Finder and double-click the pworship script. The PowerWorship main program window should be displayed. Last edited by JohnM on Sat Dec 20, 2008 9:37 pm, edited 6 times in total. Edit <pwmp_install_root>/config/pwconfig.xml and replace REPLACE with your CCLI license number. The CCLI number you enter here will be displayed on the last slide (along with the copyright information) for each song. You can also change the alignment setting in this file. For example, you can change align="center" to either align="left" or align="right". This will affect the alignment of song lyrics for presentation slides generated by PowerWorship. 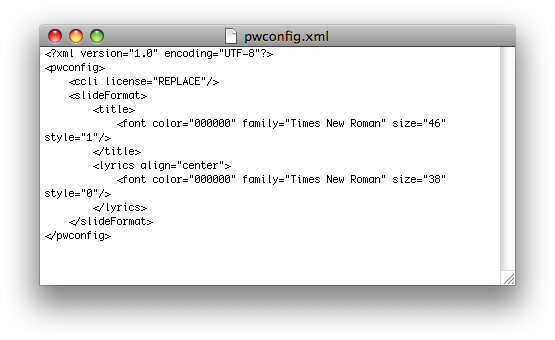 You cannot yet modify the CCLI number nor the lyrics alignment setting through the user interface, hence the need to update the configuration file manually. However, you can change the font settings through the user interface (via the Format menu). These instructions (for Mac OS) have not yet been tested with Apache OpenOffice 4. If you attempt to use OpenOffice 4 (vs. OpenOffice 3 or earlier) you will likely need to change the PW_CLASSPATH setting in the pworship launch script, before the program will launch successfully. In particular, the relative directory paths to the following files might need to be updated, depending if the file locations have changed relative to OpenOffice 3 and earlier. In addition, given that Mac OS 10.6 (Snow Leopard) comes with a 64 bit JRE - you might need to add the following argument to the JAVA command (in the pworship launch script) to enforce 32 bit execution on Mac OS 10.6 or later.